It’s time again for Bristol’s Weapon of Choice to launch another of it’s Gallery take-overs, this time from the colourful minds of two artists, SPZero76 and Loch Ness. I don’t know much about either artist, so Friday’s opening will be as much an opportunity to learn more about the their work as it will be to enjoy it. 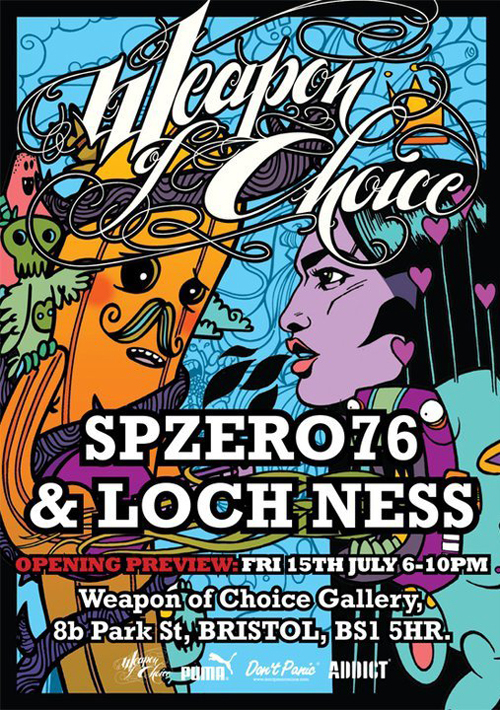 I’m reliably informed that SPZero76’s work is a combination of street art styles and digital techniques, often inspired by comic book imagery, while Loch Ness brings his equally colourful psychedelic illustrations and quirky characters to the gallery walls. The show opens this Friday (July 15th) at the Weapon of Choice Gallery (8b Park Street, Bs1), and will be followed by an after party at the Big Chill Bar, with live painting from both artists. Find out more on the flyer above and at Weapon of Choice.